My first post. I am usually pretty quiet and have been lurking for a few months soak up all the info here. Thanks for making it available to us new budgie parents. I currently have 2 budgerigars. I got them on Christmas eve this last year 2018. I have been reading your helpful guides and have a new cage and perches coming this week for them. I can't wait to set it up. These are my babies. Cheeky Chops (blue) and Chubby Cheeps (creamino?). This picture was taken with a flash so the color is off a little. 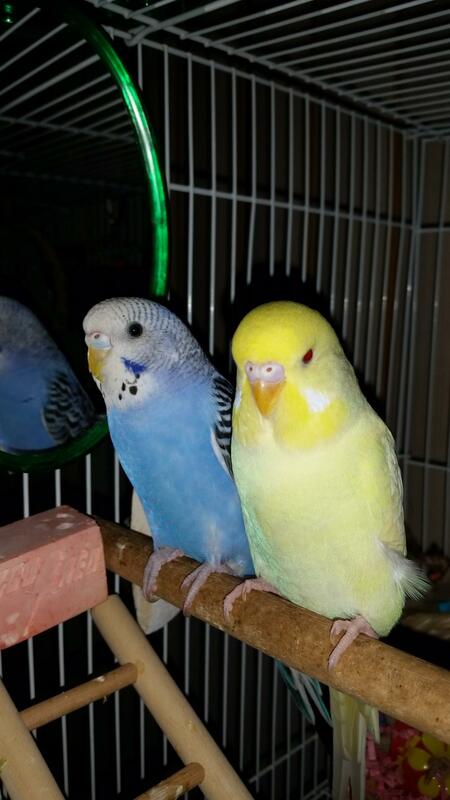 Your budgies are adorable It's great to hear that you've found the forums helpful so far! Since you have a mixed gender pair, it's important to discourage breeding. Check out the sticky below for more information, if you haven't already. We also recommend not using mirrors in the cage as this often can lead to territorial tendencies and/or other problems. Meanwhile, please be sure to ask any questions you may have after reading through the forums! We'd love to help. Hi and welcome to the posting portion of the forum! Since you've been lurking for awhile, I'm assuming you've read the Budgie Articles and Stickies. Cheeky Chops and Chubby Cheeps are precious! I hope to see lots more of them in the days to come. I'll be interested in seeing their new cage and perches once you have it all set up and "decorated". Thank you Starlingwings and FaeryBee. I have read a number of the stickies but I can not pretend I have them memorized. I will continue to go back over them. I did not know about the mirrors so thank you for that info. Different sexes... I was worried about that. I wasn't sure, but I suspected that might be the case. I definately do have questions about how to handle that even after reading about it. I will find the appropriate area to ask those questions. Your budgies are precious . Great to hear that you’ve been reading the information here, and that you’ve found it to be helpful! Check out our Articles section too.. you’ll find more interesting and useful information. We’re always here to answer questions you can’t find the answer to. Looking forward to seeing and hearing more about Cheeky Chops and Chunby Cheeps! Rearranging their cage frequently, and limiting the light they get to 8 hours a day will help tremendously. Please be sure you never put a nest box or anything that could be used as a nesting site in their cage. When they come into condition, limit the amount of protein in their diet at that time. Your little ones are just as cute as can be! If you have additional questions, after reading through everything, please be sure to ask.